Pregnancy and childbirth are special and one of the most rewarding times for a woman. The Serrão Rejuvenation Center is proud to provide specialty treatments, such as pregnancy skin care, for women in Orlando, Winter Park and the surrounding areas of Florida who are experiencing both prenatal and postnatal changes to the body. Dr. Serrão is a board certified gynecologist, specializing in cosmetic surgery of the female body. This personalized aromatherapy facial exfoliates and hydrates the skin, thereby promoting increased circulation with reduction in water retention. Special care is taken considering the sensitivity in skin changes during pregnancy and a skin analysis will be performed. This treatment will be customized for your skin type. 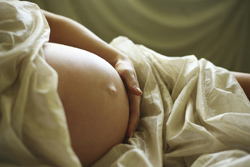 We realize that the changes that occur in pregnancy effect the balance of your skin. We will only use the best nature has to offer from our organic pregnancy line, which will leave your skin and little one a healthy glow! This peel is gentle enough for pregnancy yet provides realistic results. Whether you just want to address the need for exfoliation or problematic skin related to pregnancy, this treatment delivers. It is an excellent hydrating treatment for damaged skin or pigment changes, combining the anti-oxidant, lightening, and collagen stimulating effects of Vitamin C.
Rejuvenate with this postnatal facial designed to restore your skin’s balance and glow while giving you time to relax and renew. Organic enzymes are used to cleanse, relax, and renew. Precious essential oils are used to massage away stress while soothing the spirit. Enzymatic exfoliation brings luster to your complexion and a healing masque brings your skin back into radiant balance. The scalp, head, and neck are the focus of this aromatherapy massage. This treatment utilizes ginger and peppermint to reduce headaches, morning sickness, and neck and shoulder tension. Moisturize! Moisturize! Moisturize! That is the focus of this pampering belly treatment. Let us drench your belly with a hydrating masque, followed by nourishing oils and soothing creams. This treatment is all organic, designed to minimize and reduce stretch marks. Treat the mother-to-be with the Serrão Rejuvenation Center prenatal pedi! This pedicure is specifically designed for your sensitivity during this special time. A warm whirlpool foot soak will relieve your tired feet. A gentle massage aids in the circulatory and lymphatic systems which relieves some edema and promotes blood flow to the mother and child, reducing fatigue. The use of lavender essential oils and lotions soothe the spirit. A unique single use paraffin mitt delivers a warming comfort to the feet and leaves the skin silky smooth. We recommend the use of our organic nail polishes. Enjoy a refreshing beverage and fresh fruit with this foot treatment. Get ready for delivery! This treatment includes a neck and shoulder rescue, a pregnancy pedicure with manicure, and a bikini wax. Treatments may be substituted or added per request and fees may be adjusted accordingly. After 30 years in the medical field, Dr. Serrão knows that compassion and skill are equally important when it comes to providing for his patients. The providers at our fully-licensed medical spa understand that mothers-to-be have unique needs, and we have come up with procedures that are targeted towards those. Many women in the Orlando area have turned to Serrão Rejuvenation Centers to help them achieve their cosmetic goals after hearing about the experiences their friends and family members have had. We encourage you to experience our high quality of care for yourself by scheduling an appointment. Pamper yourself with one of our pregnancy skin care treatments. At Serrão Rejuvenation Center, our experienced medical aesthetician offers pregnancy skin care for women in Orlando, Winter Park and the surrounding areas of Florida. Contact us to schedule a consultation and begin your rejuvenation with Dr. Serrão, a board certified gynecologist, specializing in cosmetic surgery of the female body.